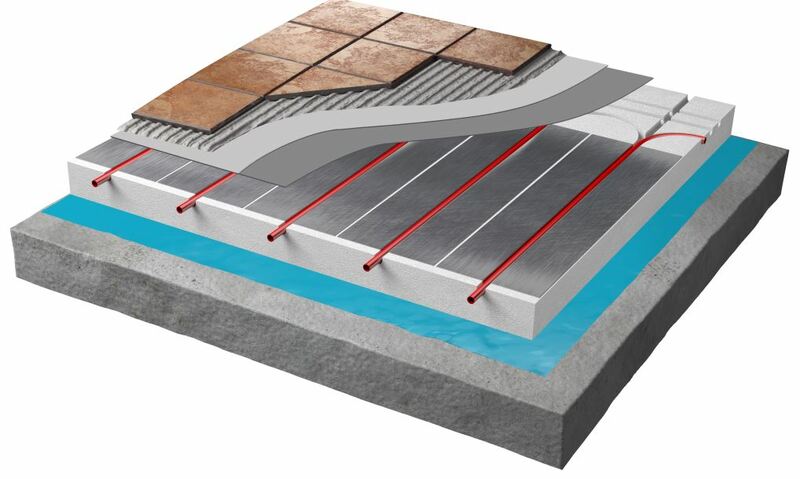 Water or hydronic underfloor heating systems are a popular choice for extensions, new and self-build projects, dwellings or building. The system uses water for heating, so it can be linked to virtually any heat source from a standard boiler to newer sustainable technologies such as solar thermal energy and heat pumps. High quality thermal insulation with a conductivity of 0.022 W/mk. Made from a PIR foam, which has zero Ozone depletion potential. The product has a BRE green guide rating of A.
Metro Insulation is made from a PIR (polyisocyanurate) foam which has zero Ozone depletion potential (ODP). Its blowing agents are CFC/HCFC free, which would otherwise potentially damage the atmosphere. The product has a BRE green guide rating of A. The rigid PIR foam core is faced with aluminium foil composite to both sides and the compressive strength when tested to BS EN:826 exceeds 160KPa. The insulation boards are 2.4m x 1.2m and come in a thickness range of 25mm to 100mm. The Metro Insulation suitable for use with Metro, Nexxa, Forte, Econna and Tectora hydronic systems. Fast-tracked floor preparation system for use as screed replacement. Comprised of two 6mm-deep cement top and base boards to provide a stable surface for the floor finish and ensure even heat distribution. Warmup’s Dual Overlay Concrete is a screed replacement board-based system manufactured with high-quality concrete for even heat distribution. Recommended for use with the Econna, Contura and Total-16 Hydronic systems, the low-profile top and base boards are quick to install and protect the underfloor heating system. The 6mm deep boards come in 1.2m x 0.6m sized lengths and have a thermal Rm value of 0.038 per square metre. Designed for both wet and dry rooms, it is suitable for a variety of floor finishes. The two layers of boards provide low heat resistance, allowing efficient heating and are bonded together to create a solid subfloor structure with the included contact adhesive.